This summer, I’ve really focused on sewing projects to gain confidence in the craft because I have so many ideas and almost zero knowledge of how to actually sew them. I know I could take a class, but I don’t want to stop crafting in order to take the class… You’re gonna need a spoonful of sugar to swallow that bit of silliness, right? But it’s true – I don’t want to sit through a class, online or otherwise right now. After getting two advanced degrees, you’d think I wouldn’t be so averse, but it’s not the fact of of parking my behind for an hour or two in a “classroom.” It’s more that I have very limited time to “adult craft” (crafting without a 2.5 year old on my lap), so I want to produce something during that time. So, here comes my little sister’s birthday, and I knew I wanted to sew her a purse. Reading what you just did, you can see the problem: I had never sewed a bag before and it was bit intimidating for my beginner-stage sewing self. After a TON of searching, a lot of head scratching, and a healthy dose or two of deep breathing, I was able to modify a tutorial and adapt it to what I wanted. Before we get to the bag, I made my sister a couple of small gifts that I stashed inside, thinking she could use some pampering for her birthday. Using tutorials – hey, those are kind of like a classroom, right? – I was able to use the brilliance of others to ease my sewing anxiety. 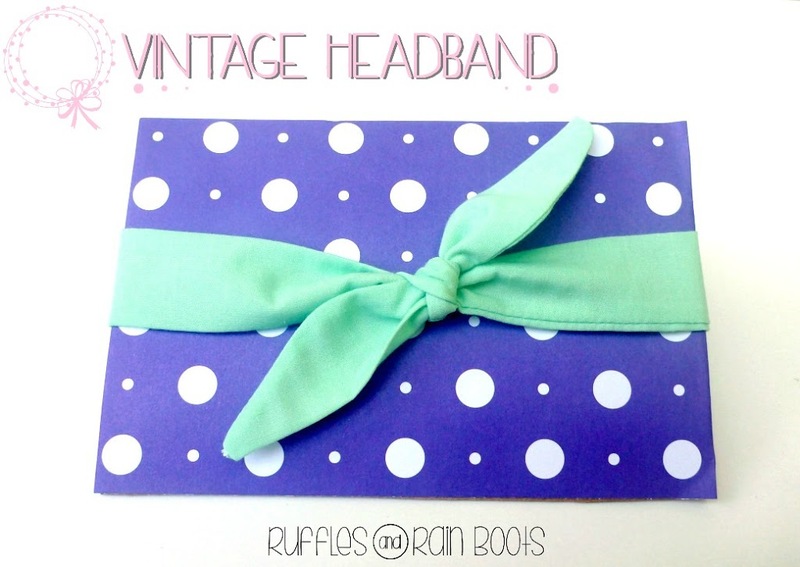 The first gift I made was a vintage-inspired head band, using this tutorial by Liz with Momtastic. My sister has an adorable short hair style (that I’m currently coveting in this heat), and I thought this would look great with it. It wasn’t too hard to make, although it was a bit more labor-intensive than I originally thought. Think “carpel tunnel inducing” because you have to turn those skinny, little strips of fabric inside out… Ouch. Once it was sewn and I gave my hands a break, I wrapped it around a piece of patterned paper-covered cardboard and stuck it inside the bag. Another gift I made for Becky was an eye mask because she travels all the time for both work and play. 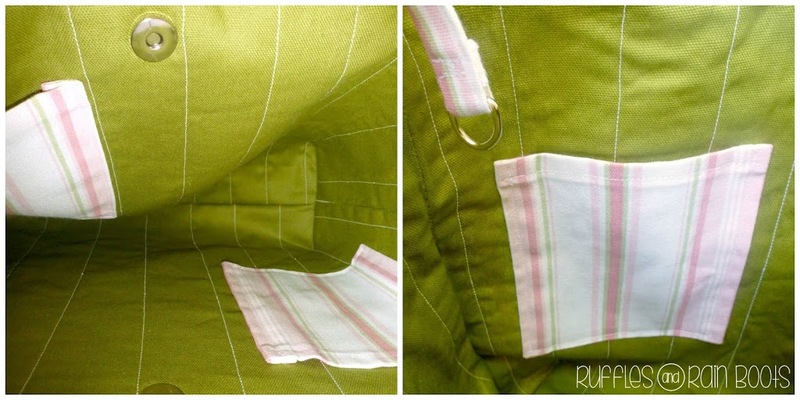 Using this tutorial from Sewing Lab, I am going to make another one of these for myself because I absolutely love the one I made her! Instead of using cotton for both sides of the mask however, I used black satin on the skin-side. Satin ‘luxes it up a bit’ and it always feels nice and cool against the skin. The black satin, in particular, will hide make up smudges. Win-win, right? 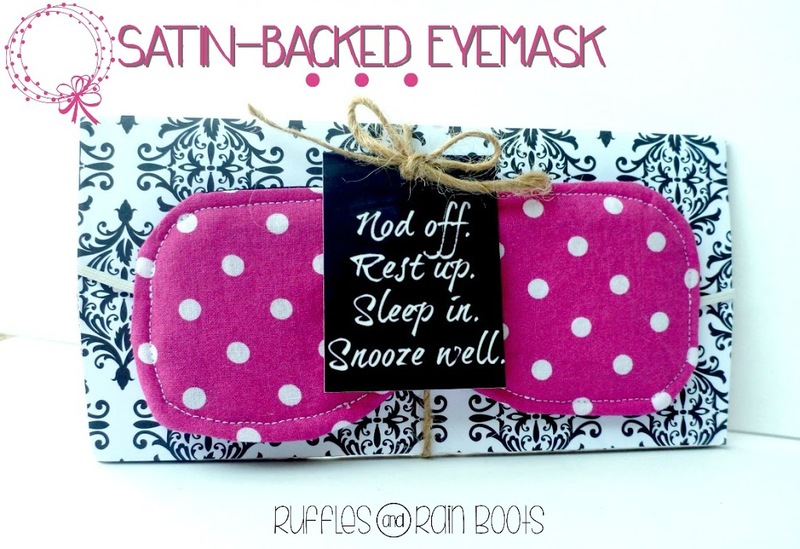 For gifting, I wrapped the eye mask around another piece of patterned-covered cardboard and added a small tag. If you’re going to make this as a gift, feel free to use this tag I’m offering as a free printable. I printed mine on 4 x 6 photo paper instead of card stock – I just love how the photo paper gives the chalkboard background depth. 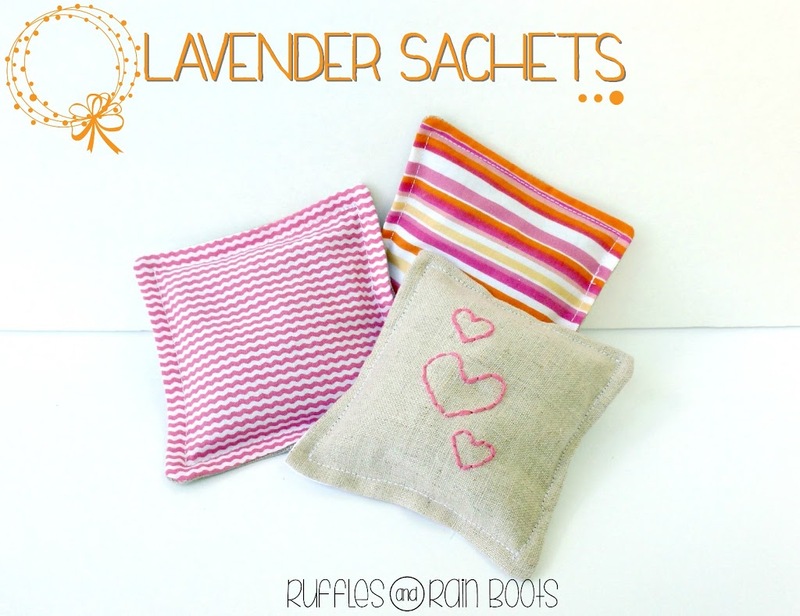 The last bit of mini-gifting was a set of lavender sachets. I’ve written about these here but I use the tutorial (sort of) from here. I hand-embroidered –okay, I tried to hand-embroider — some hearts on one of them. They sort of look like hearts, right? 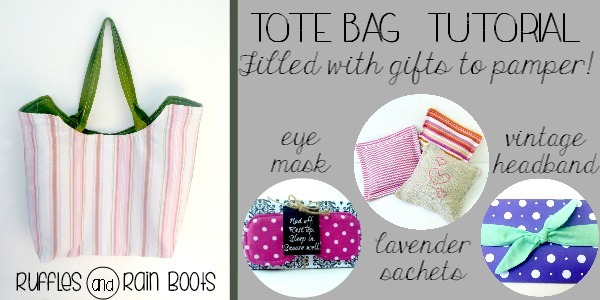 The original bag I wanted to make for my sister was this tutorial by Ashley at Make It and Love It. I really liked the look and size of the bag, but I needed to make a few changes. 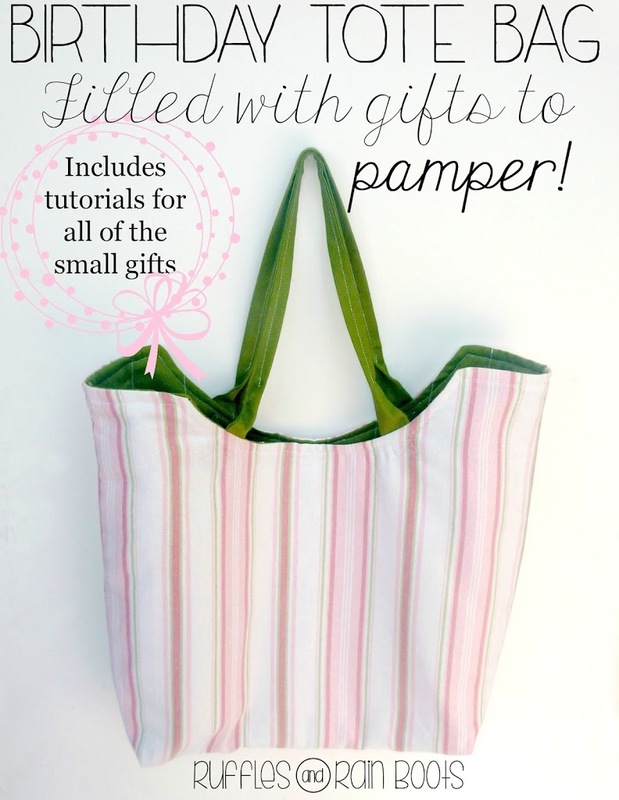 Here’s a tote bag tutorial (with gifts to pamper) that is sure to please! In order to make it more purse-like, I made some changes to her tutorial. I added more structure with an interfacing, added some very basic straight line quilting to the lining, and made some small additions. Small additions like a key ring, a magnetic closure, and pockets make a big impact in changing a tote bag to a purse. Even if a gal has a purse organizer, pockets always come in handy! Well, that’s it for this birthday bag for Becky. I hope she likes it and gets to use it before our summer is over. In the Pacific Northwest, fall could be here tomorrow!